Wednesday, Feb 7, 2018, 7 – 8 p.m.
CoSSaR is delighted to welcome Secretary Roger Millar to campus for our Winter 2018 seminar: Stewardship of Washington’s Complex Transportation System. Roger Millar was appointed Secretary of Transportation by Governor Jay Inslee in August 2016. He joined the WSDOT as Deputy Secretary in October 2015 and was appointed Acting Secretary in February 2016. Millar oversees an agency of 6,800 employees, with responsibility for 18,600 lane miles of highway, 3,800 bridges, general aviation airports, passenger- and freight-rail programs, and Washington State Ferries, the nation’s largest ferry system. Millar is a second generation civil engineer with 38 years of experience in the transportation arena. During that time he has worked in construction, design, planning, research, policy development, management and administration in both the public and private sectors. Millar has served as public works director, city and county planning director, arterial streets manager and vice president of a multi-national engineering firm, among other assignments. 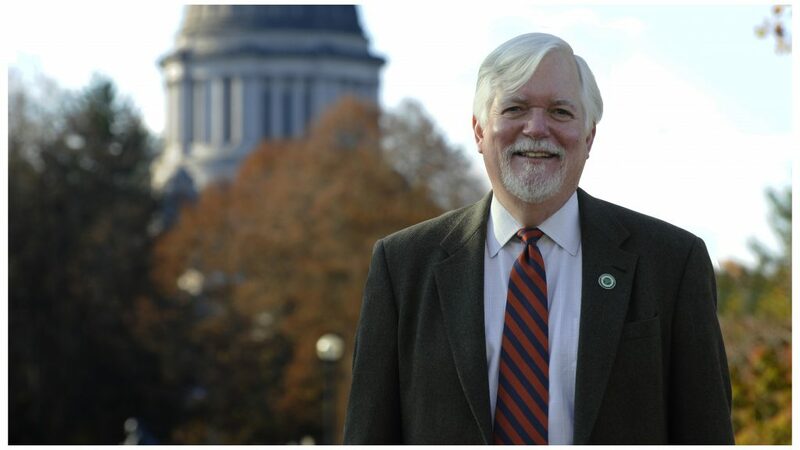 Prior to joining WSDOT, Roger served for five years as vice president of Smart Growth America, a national not-for-profit organization, providing technical assistance to state transportation agencies in Florida, Michigan, Minnesota, Oregon, Tennessee and Vermont. During that time he also served as director of the National Complete Streets Coalition. Millar was elected a Fellow of the American Society of Civil Engineers (ASCE) in 1999 and received the ASCE President’s Medal in 2016. From 2000 to 2014, he served on the ASCE Committee for America’s Infrastructure, which produces the nationally recognized Report Card for America’s Infrastructure. Teams Roger led have won national, state and local awards for planning and project delivery. Those awards included the Association of Metropolitan Planning Organization’s National Award for Outstanding Achievement in Metropolitan Transportation Planning and the American Consulting Engineers Council Honor Award. A graduate of the University of Virginia, Millar is a registered engineer in Washington and five other states. He is a member of the American Institute of Certified Planners and a certified floodplain administrator. Millar has served as president of the Oregon Section of the American Society of Civil Engineers and of the Montana Association of Planners. He is married to Candis Millar, the former planning director of Billings, Montana (retired 2016), and has two teenage children and a black lab named Ouzel.